I spend a lot of time deconstructing job sites so here are 3 job sites that I admire in terms of design. In my latest screencast I critique the new internship site, Youtern. Want your job board deconstructed? Join my premium membership site and I’ll do it for free. Or you can hire me to do it without joining for just $129. My goal in each screencast is to help you improve your job board so you can make more money. Although the pace has slowed due to the economy, new job boards are still being launched. 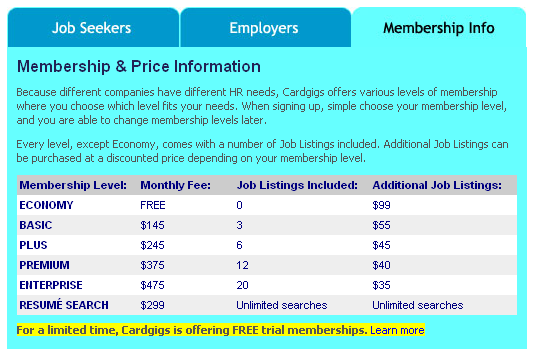 Yesterday I discovered Cardgigs.com, a micro-niche job board serving the ‘payments’ industry. I call it ‘micro-niche’ because they are targeting a very niche industry and I do see more of this narrowly focused sites popping up. I think industry focused sites still have much growth potential. As far as the design goes I have a lot of praise for the homepage. Its a solid interface that offers ease of use, and plenty of ways for jobseekers to interact and search jobs. The graphics are clean and professional looking. My mantra for job board design is that it has to inspire people to use it, and Cardgigs definitely does. It has some jobs in the database although a few of the home page links showed no listings. A backfill would be useful there. I also noticed that browser titles do not change so their SEO needs to be looked at. The pricing model is interesting and based on membership. So its good to see niche boards coming along. Hopefully 2010 will be a much better year for those that still exist.